Sleater-Kinney was formed in Olympia, Washington in 1994 by vocalists and guitarists Corin Tucker and Carrie Brownstein, with drummer Janet Weiss rounding out the core lineup in ‘96. Made up of members already embedded in the riot grrrl feminist punk scene (with Tucker previously of the band Heavens to Betsy and Brownstein of Excuse 17), Sleater-Kinney grew to become one of the most well-known groups to have emerged from the movement. Before going on hiatus in 2006, the band released seven studio albums. Their second, Call the Doctor, is considered by many to be the group’s first proper release, as it was the first record Brownstein and Tucker wrote and recorded after their previous groups had disbanded. Call the Doctor and 1997’s follow-up, Dig Me Out, were both big critical successes, and later albums saw the band gathering an even larger, more mainstream audience. After the success of One Beat, released in 2002, Sleater-Kinney began opening for Pearl Jam. Playing these larger arena shows influenced the band’s next, more classic rock-sounding release, The Woods which was the final album the band released before announcing their hiatus in 2006. In 2014, Sleater-Kinney reunited, releasing their eighth studio album, No Cities to Love, and setting out on a tour through North America and Europe the following year. Despite a long hiatus, the release was another big success, prompting questions about whether we can expect new music. And though we don’t have any indication of when specifically we can expect a release, Brownstein did mention earlier this year that the band is "very slowly" working on a new album. Sonically, Sleater-Kinney definitely bears comparison with their contemporaries and influences both within the riot grrl scene—like Bikini Kill and Bratmobile—and outside of it, like Sonic Youth and Throwing Muses. But one major differentiating factor here across the board is in the lower registers. As Tucker and Brownstein are both primarily guitarists, Sleater-Kinney has never had a dedicated bassist. Rather than writing basslines and recruiting a bass guitar player, Brownstein takes on lead guitar duties while Tucker rounds out her rhythm tones with a deep, meaty low-end, resulting in a unique interplay of huge-sounding guitar riffs. To help her fill out her guitar's low-end, Tucker told Guitar World that she turns to her favorite pedal: the Bass Micro Synthesizer by Electro-Harmonix. "I have this Electro-Harmonix Bass Micro Synthesizer pedal and I absolutely love it. It’s the sound I use on the song 'Price Tag.' I’m basically playing a bass line even though I’m playing a guitar, and [that pedal] makes it sound really scary, weird… and unsettling." The Micro Synth is joined by other relative mainstays that have enjoyed long residencies on Tucker's board, like the Boss GE-7 Graphic EQ and Eventide Mod Factor, with the spaces leftover reserved for a frequently rotating cast of colorful fuzz and distortion boxes. In the same interview, Tucker talks about how her very first guitar—the one she used all the way up to recording Dig Me Out in 1995—was one that her father had hand-built and painted from the parts of a "weird Swedish guitar, maybe a Hagstrom... I thought it was really cool so he gave it to me. I played that in my first band, took it all over on tour and recorded several albums with it ... until he eventually repossessed it. [laughs] But it’s still in the family." After playing her dad's Frankensteinian creation for years, Tucker upgraded to a white Ibanez Roadstar she bought in Olympia. Later years saw her experimenting with Danelectro models like the U-2 and DC-59 and '60s Gibson SG Juniors and Les Paul Specials. Guitarist Carrie Brownstein is herself partial to Gibson, upgrading from an Epiphone SG Special to a Gibson SG Standard in 1999—the guitar that she's still most-known for playing. “Something with the SG, like there’s two devil horns coming out,” she said on WTF with Marc Maron. Though she has experimented with Rickenbackers like the 425 and 330, the only model that Brownstein has used almost as frequently as her SG is her Reuben Cox Custom Thinline Telecaster. Like many guitarists, Brownstein's effects rig has morphed and evolved over the years, save for a few classic staples like the Boss BD-2 Blues Driver, SD-1 Super Overdrive, and DigiTech Whammy 4 that can be heard on tracks like "Jumpers" and "Entertain." Longstanding classics like the Line 6 DL4 Delay have made appearances on her board, along with boutique offerings like the Zvex Super Hard On boost and the Katzenkonig and Belle Epoch from longtime Portland neighbors, Catalinbread. In more recent years, her rig has also featured the robust RJM Mastermind PBC—essentially a rack mounting system in pedalboard format, complete with an internal line mixer and onboard MIDI controller. 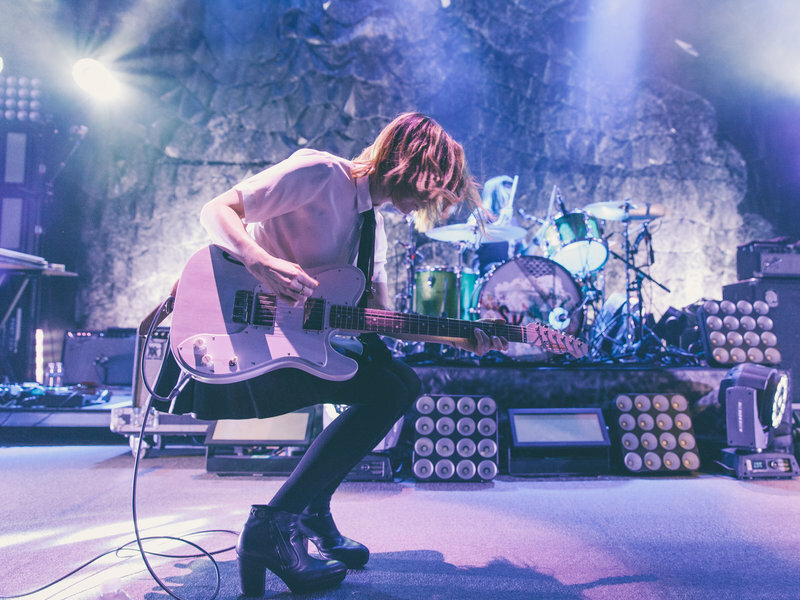 Both Sleater-Kinney guitarists have talked about how they like to experiment when it comes to amplifiers—especially in the studio, where they tend to use a lot of different, smaller amplifiers—like a Fender Pro Junior or Champ and even battery-powered Mini-Twins—for various parts of each track. "I tend to favor recording with smaller guitar amps as opposed to big giant live rigs, and we would just go from amp to amp, song by song," producer John Goodmanson told Mix in a 2000 interview about the recording of All Hands on the Bad One. Though Tucker can be seen playing through a variety of amplifiers on stage over the years, from Orange stacks to Fender Twin Reverbs and large, naturally distorting Ampegs, Brownstein has remained more consistent, almost always opting to run through a Vox AC30. Drummer Janet Weiss has kept her kit streamlined and minimal over the years, opting for the three-piece-style kits often favored by punk and alternative drummers. Once she has a kit she likes, she tends to keep playing it, remaining sonically consistent for as long as she can keep ahold of it—something she tells Fred Armisen in the video below that she's not always good at. "I'm not very good at holding onto drum kits, and I've sold actually some incredible pieces that I shouldn't have sold," she said with a laugh, citing the '65 Ludwig Club Date that she used for a decade and can be heard on most of Sleater-Kinney's records.